A story of a brave woman who took a leap of faith in love and in a man to redefine her dream! Questions and stories recorded/written and firstly edited by Crystal Ra Laksmi. Additional editing by Janet Hudson. You are an adventurer in life and on the sea. It has been quite a journey for you to get here where you are. If you look back into your roots, what or who you think was most influential to get you to where you are in life right now and who you are today? Mentally, emotionally and psychologically – my mother was one of my biggest influences. My father gave me this body that has a fabulous aerobic engine, which means I can go and go and go and I love to use my body for all sorts of physical pursuits – like dancing, skiing, hiking, climbing, cycling, and yoga, for example. I am grateful to my mother for giving me a love of life and the natural world and my intelligence. She really believed in me. She was my biggest fan when I was growing up and I really appreciated that. She gave me a love of books and language and of learning, and my father did too. For example, my father read the whole encyclopaedia when I was a child. I also got curiosity, that really describes me and which got me here to Mexico. Sailing in Mexico. Photo from Janet’s private collection. But I also must say that many, many other people influenced my life later as well. But there are too many to mention. Some of them gave me information about something which lead to something else and Nikk, my new partner is the latest gift. That is how I got to Mexico. I piggybacked on Nikk’s dream to come to Mexico. I heard about it and felt like I would love to do that. The first time I was in Mexico was in 1997. 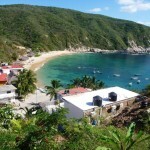 I did sea kayaking in the Sea of Cortez and kayaked out to the islands there and fell in love with that part of Mexico. Your biggest dream in your life right now? I do not have a dream for myself right now. I have done everything that I told myself to do when I was 20 years old. My only thing that I still want to do and develop is that I have a desire to work with people who are dying. To help them and their loved ones with that transition. I am very fascinated with the process of death, I guess it is a very Scorpio thing. Imagine if you would be 90 years old, looking back at your life – what would you say – What was your life about? I would say that it was about teaching and helping other people to gain insight, experience, knowledge and understanding. I have always been a teacher. I resisted public school a lot, it was not so good for me. When I was younger to become a teacher was not appealing to me at all. 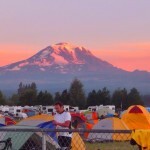 Mt Adams, Cycle Oregon 2014. Photo from Janet’s private collection. My friends often came to me to share their problems. I listened and saw things, in a new way or a different way or could show the way how to solve some problems they had. Personal growth for people has always been my interest. That was the same for my students, I wanted to teach them the subjects through that perspective. When I was 21 I was going to be a doctor – a brain surgeon as I was so interested in it and wanted to help people with brain injuries. I was fascinated how it worked and get to know the ways that people with illness and injury could get help. But after some time I decided it would not work, so I switched to education at the end of my third year of my university. 1 year later I went for a week to have my classroom experience teaching. I had a great time. I really enjoyed it. 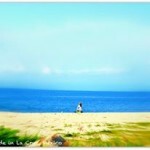 Instead of finding it difficult I found that it was really easy for me. I liked to interact with the students, it energized me. Not a little while, but 40 years! I mostly taught sciences. For many years I taught chemistry – because it explains how the universe works. And…I got paid to make explosions. How cool is that? 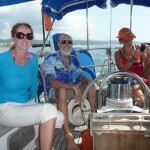 Sailing with captain Nikk and Janet (behind the camera) and Estonians Tiina and Crystal Ra in Mexico. Photo from Janet’s private collection. – What did you care most about? My children, grandchildren, my close relationships, friends and family, nature and natural world. I have always cared about the natural world since I was small. I could influence students to get in touch with nature and get a close relationship with nature, so they would also care about it. I created many extracurricular activities, like clubs and after school teams and summer teams that would do environmental research to try to save wild places. It is a gift to explore the outside and inside world. 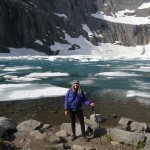 Hiking, cross country skiing, climbing, investigating and working for preservation are all important in my life. Getting students involved with the natural world – very proud about that in whatever way. My own children benefited from that too. In the Canadian Rockies. Photo from Janet’s private collection. My husband fell in love with somebody else. I stayed married to him 3,5 years while he had an affair because we had children. I had good friends that I could talk with when I was upset and I always tried to take the higher ground – not always successful, but tried to ask myself, what would be the way to approach this so it would do the most good and the least harm. Because of that I came out of that time much stronger in some ways. I never wanted to have a divorce. I also finally realized that situation could not continue with kids, and not to deny and hide it to everyone. I just realized that children were 8 and 3 when we stopped. I knew I could take care of myself, but it was bad for my emotional well being. It resulted in my having difficulty with trusting men for very long time. 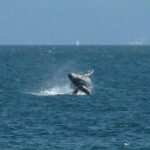 Humpback whale in Banderas Bay. Photo from Janet’s private collection. Because they broke up not only our marriage, but also the other one too. It caused lots of emotional damage. I waited 10 years to do counselling, because of the cost. Then I helped myself. Made me wish I would have done it years earlier. It helped me to understand myself better, had to dig deep into my childhood and my adulthood to find out where these emotional patterns came from and recognise them, be able to watch them, not to be controlled by them. 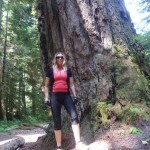 Ancient Douglas Fir near Mt St Helens while on a training ride. Photo from Janet’s private collection. I explored my hidden emotional agenda, which I did not want to affect my presence in the world. I learned how to watch my mind as a buddhist does – because your mind creates your emotions. Many people said – your emotions just happen, you do not control them – but it is not true – it comes from your mental thought patterns. I learned to watch my thoughts. To notice when a thought creates an emotion – emotional discomfort or resistance, sadness, anger, frustration. We have those emotions, because we are in the physical body. Paying attention was a big benefit for me. That is why I started studying buddhism and it made so much sense to me – I already had come to understand a lot about how the mind works, by paying attention. This was big part of buddhism – watching your mind. 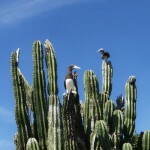 Cactus and Brown Boobies in Chamela Bay. Photo from Janet’s private collection. I started a very intense meditation program – 4 hours sleep at night, 2 hours of meditation a day, teaching at school at the same time, with tapes which synchronised my brain waves. So they took me down from the beta state monkey mind, to the alpha – the hypnotic state, then theta, and then the deepest state is delta state where your brainwaves are really slowed down. 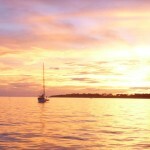 The images from the subconscious come up – you are awake and dreaming. Synchronicity here meant – using the tapes to synchronise your left and right brain. I say whatever the universe brings to me that is positive, I welcome it. I know the right people, books, music will show up, opportunities – I know that if I have an interest – something I am doing – things will appear. Sometimes things will disappear – if it is not right – or people will just disappear. I won’t be interested in it or them any more. Try it – try new things – like windsurfing, dancing or whatever. Even my husband’s affair, the divorce – I understood that I would not be today the person I am without it, but I am sorry that my children were deprived of two loving committed parents. They both have wonderful marriages, so I think things turned out OK for them overall. Isla San Francisco in the Gulf of California. Photo from Janet’s private collection. I think about things like going after your dreams is important – as I did when I spent my 3,5 years in Australia. So going about our dreams we use like both sides of the brain – the masculine and feminine, including the magic ways to allow life to happen. No linear way going about things. Lots of people climb out of the despair because of love. So was the case for me too. Me and Nikk, we met many many years ago. Nikk was a year ahead of me in school and we met in band when I was twelve and he was thirteen. We would have gone to the same primary school but his house burned down when he was four. We didn’t date in high school but we saw a lot of each other in band and at swim practice and meets. Janet’s and Nikk’s Christmas card from Mexico. Photo from Janet’s private collection. Then we didn’t see each other again for forty years. A high school reunion brought us together and our mutual attraction and shared interests has kept us together for eight years. My new partner Nikk and I met quite soon after the second divorce. Yes it was firstly all about healing. That is what it was. Dream – it was too soon, it did not seem like we had enough in common. But later we discovered that it is not only all about healing, it is also about fun. Ease. But still – it is good to question yourself after your long partnership with someone is over and when you enter a new one. Transforming something what was into something better. It was 6 years after the meditation program started – I was attending this new age church. There was a workshop where a woman came and she sat and meditated on the stage and she supposedly gave to each of us a gift psychically. The next day I walked into this church and they were playing this song called ‘Give yourself to love if love is what you are after’ and I felt my energy go out about 3 feet on each side and my heart expand and I sat down and this stranger sitting next to me asked if I was aware that my energy was clear over there. He could feel it also. Sailing by the Happy coast of Mexico, on the way to Barra Navidad. Photo from Janet’s private collection. This is how I could connect with my students so I could know what was happening with them. It was a reinforcement, that we are all energy – stuck in this material pattern. That is my true nature. That was the most inspirational thing that happened to me. That I could be that big energy body. Why was it so inspiring? Because there is so much more to this existence that we normally experience. Not only did I feel it – the other person next to me felt it too. I connected to that person. It validated all these feelings I have had about the energy body that we have – as well as the material body. And it is all connected to love. 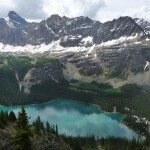 Yoho National Park. Canadian Rockies. Photo from Janet’s private collection. I believe I always will have enough. I do not want too much. I do not want to manage money any more than I have to. I am a friend with my money. When I was very young my parents were not rich and I wanted to be wealthy. By the time I was 20 I completely flipped – I did not want very much at all. I wanted just enough. I became very spiritual. Very spiritual life, was part of it. Then I found that even when I really barely had enough and I was sometimes forced to sell things, to buy groceries for my daughter and I, and I was sorry about that, but I know it was a transition – whenever I needed I got it from someone or somehow. It has happened over and over. I will have enough. It does not do any good to be worried or upset. Because even if you do not trust the universe that you get what you need – then you still get it. I am so anti worry. Do not want to waste time and energy with worry. I trust that the money will be there and if not – I need to get creative. I have done many things to earn more money. I took classes and worked my way up the pay scale, and I worked many part-time jobs when the kids were young. My kids got to earn their own money and help out. They got scholarships and helped to provide their own education. 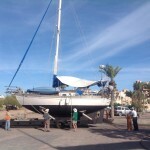 Sailing Vessel ‘Balance’ getting an upgrade. Photo from Janet’s private collection. Now I am at the point of life where I wanted to be, so I have enough so that I can also donate to causes I believe in and help my friends. I can treat people and I like that. I can give money to Aruna for Wayland for example. I donate a lot to charity and to my kids too, my daughter especially, and my dogs. Money helps and I am glad I can channel it and keep it circling around. Having enough money to take care of myself. Not to depend on anyone else to be providing money, except what was contracted for my retirement. I have a contract for my social security and retirement that I paid into for years. Now the government and the state gives me the money and I benefit others and myself. Puerto Vallarta, Mexico.Photo from Janet’s private collection. I am retired and I have the retirement income. I think I am so lucky to have that. You have been writing your blog for some time now. How did that happen and come about and why do you do it? Before July 2012 I used to do travel reports for my friends. 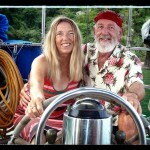 They convinced me to write a blog about traveling to Mexico by sailboat, so I learned WordPress and joined the blogiverse. I try to post about once a month. I do it because I love communicating in writing and I love photography and I get to share my adventures and explorations with other people. 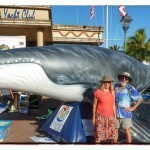 Janet and Crystal Ra in Mexico. Photo from Crystal’s private collection. I met Crystal in the summer of 2013 in La Cruz, when we were both living here. She was recommended for an energy and healing work by a friend. I immediately recognised that Crystal was able to channel and transmit and help to create a wonderful energy. We started working together with sessions first indoors and then in the water – ‘Stretchdance in the Sea’ classes. Crystal has the kind of joy and love of life that makes me happy to know her. And we have shared many wonderful experiences during the past few years. I am so glad that we are friends. We have a mutual admiration society. How can people contact you and hear more about your life? Thank you for your time and all the best for your journeys! It was delightful to hear about your adventures life and insights. I am so sure it will inspire many of our readers. Please feel free to leave a comment down below or share with your friends or join my list by clicking here and leaving your email in the blue box. This entry was posted in MY BLOG and tagged Adventure, chemistry, courage in life, courage of life, Crystal Ra Laksmi, divorce, Janet Hudson, live your dream, Love, money, sailing in Mexico, Wantra by Crystal. Bookmark the permalink. Thank you for sharing such a moving and inspiring interview, Crystal. You have a wonderful way of choosing questions that not only produce fascinating answers, but enable me to connect with your guest in a real way. Janet is a remarkable, courageous, and genuine. I was moved by her honesty, and I think I learned something about myself at the same time. Very well done. Thank you. Wow, thank you Joylene, you are so fast to give support. I am not used to that! Yes we are still in the process of fixing it and I have not yet figured out how to just let someone view the scheduled work, so I posted it to Janet for review. We will see when the official release will be. I am so enjoying these interviews. I learn so much more about the people, cultures, words, literature. I grow as a writer as well. I love it. But I also did not imagine that producing an article of 3000 words times two (also in Estonian) would take so much time and energy. But because the stories are inspiring. They can be put together in to the book by the end of the year. 12 interviews which can inspire people. I am figuring out that one of the message I have for the world is that it is not only the big authors or big scientists who change the world. Also us, ordinary people can make a change and a difference. It is all about finding those pearls and the interviews I am planning tend to all have that in common. In addition also the message that you do not need to have millions in order for you to live your dream. You can just live a very simple life and be smart about things and then things work. With ease. Mexico is an amazing place to learn to surrender and to do that. Thank you Joylene for being here for me as this week has been a huge challenge for me as a writer and even though we run away from pain most of our lives, we the writers and artists – we need it, as it inspires us to write and share it with the world. If not the pain, then how we got through it. I know you are a master in that matter and I am happy that we can explore more of it next week with you. Have a nice weekend! Crystal, thank you so much for the great interview with my dear friend, Jan. Even though I have known her for many years, I learned new things about her through your interview. Thank you again for letting others learn what I have learned, that Jan is a very special and unique human being and the best kind of friend to have! 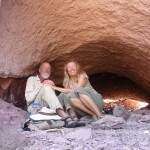 I have visited Jan and Nikk in LaCruz and look forward to returning there in the future. Thank you dear Peg for the visit of the blog and also leaving your comment. It warms my heart that you got some new info about our common incredible friend and power woman Janet. I am so proud of her and so lucky to have her as my friend too. We have had many beautiful moments together and hopefully in the future too. Next time you come and visit, look me up and maybe I can show you some magic in the water;) Janet loves it!Hugs from La Cruz! Thank you dear Katrin for your comment and the time you took to read through the long adventure we had. I am so glad it brought out more who Janet is and you even got some new info too. I am going to work more to polish my different talents. 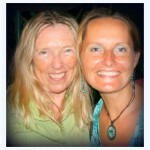 Thank you for your continuing support, dear adventure sister Katrin!